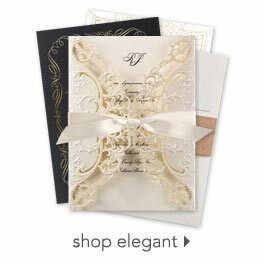 Our collection of Western wedding invitations includes an excellent range of designs and styles. Whether you're searching for a classic country floral or something with true cowboy character for your Western wedding, we guarantee you are going to enjoy this selection. Be sure to take a look at country wedding invitations as well for even more options. We also recommend checking out our many wedding accessories for your ceremony and reception. You will find some beautiful options in colors and themes that will match your Western wedding style. Wedding napkins add a pop of color and a personalized touch to your reception. Serving sets add a little glamour to your cake table and personalized toasting flutes will dress up your head table.